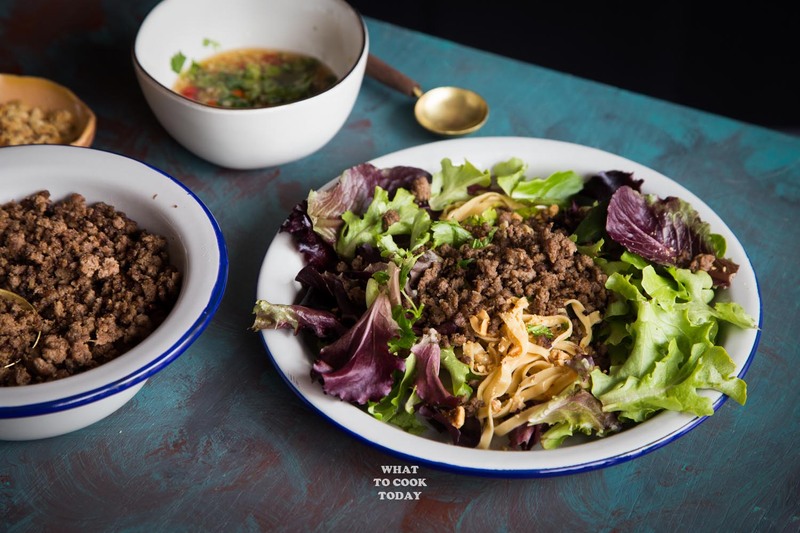 Asian Crispy Ground Beef Noodle Salad – Ground / minced beef are stir-fried in aromatic five-spice powder until dry and crispy and pile on noodle and salad and drenched in sweet, sour, and spicy dressing! It’s hard not to get addicted. Can be made low-carb. 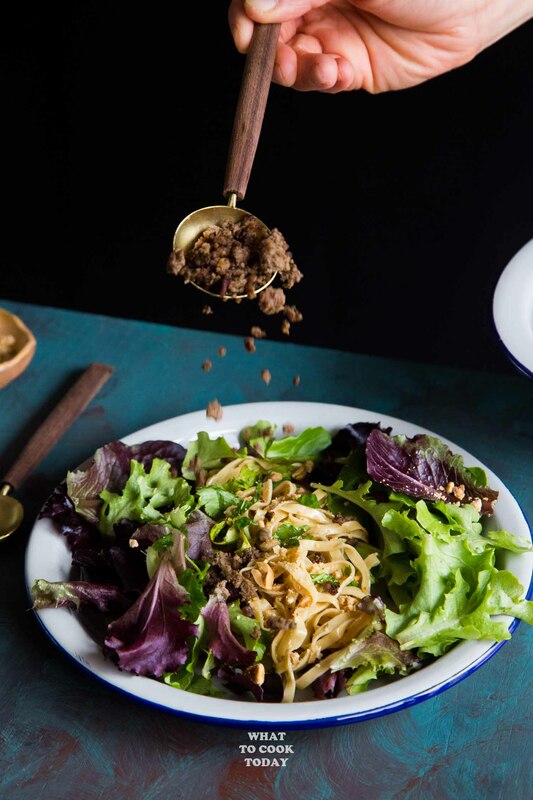 This Asian crispy ground beef noodle salad is another one of those recipes you should keep in your recipe list for that easy and delicious weeknight meals. 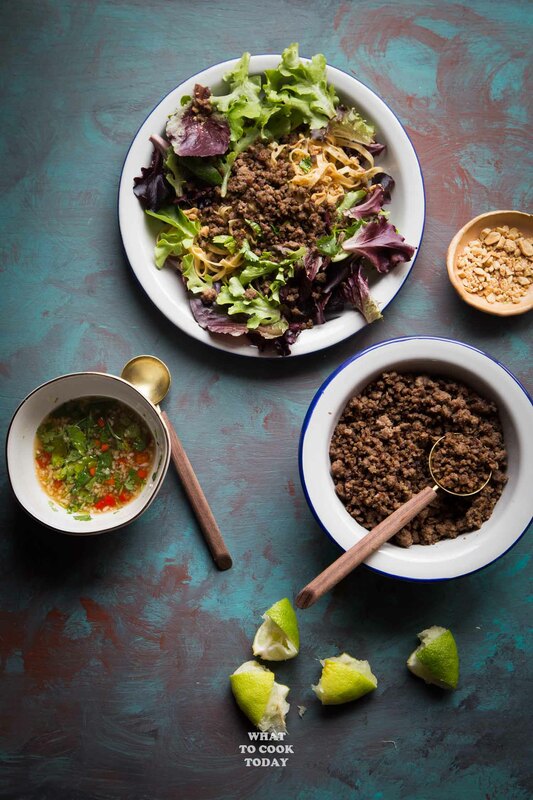 WHAT MAKES THIS ASIAN CRISPY GROUND BEEF NOODLE SALAD GOOD? 1. The beef is stir-fried until dried and crispy. Now, it’s not that kind of potato chips crunchy you are imagining. It doesn’t make any crunch, but the beef pieces are dry and slightly charred, which makes a great topping for salad, rice, or noodles. 2. 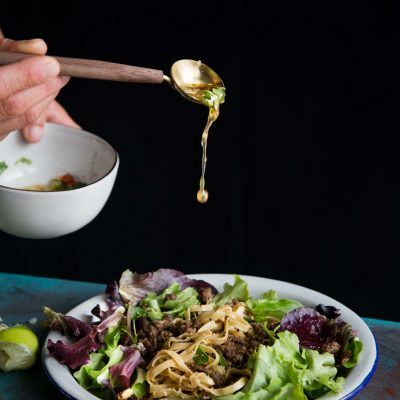 The noodle salad is then drenched with a dressing made of fish sauce, honey, lime juice, garlic, and chili. Speaking of taste bomb! It’s right here baby! The dressing ties everything together, yet it’s such a light dressing that you don’t feel guilty pouring it on top of your salad and noodle. 3. The contrast of texture in this salad can be addicting. 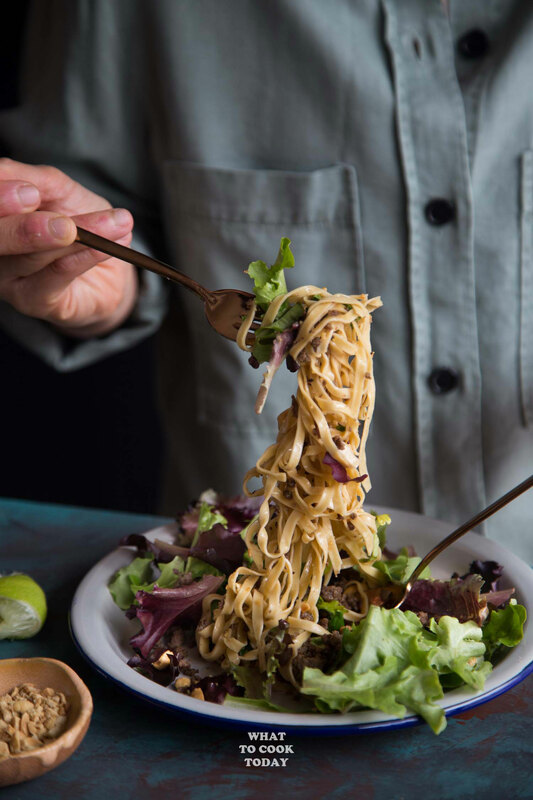 The fresh crunchy salad with slightly soft and chewy noodles, the crushed peanuts, crispy ground beef and that umami-loaded dressing! I guess enough said? 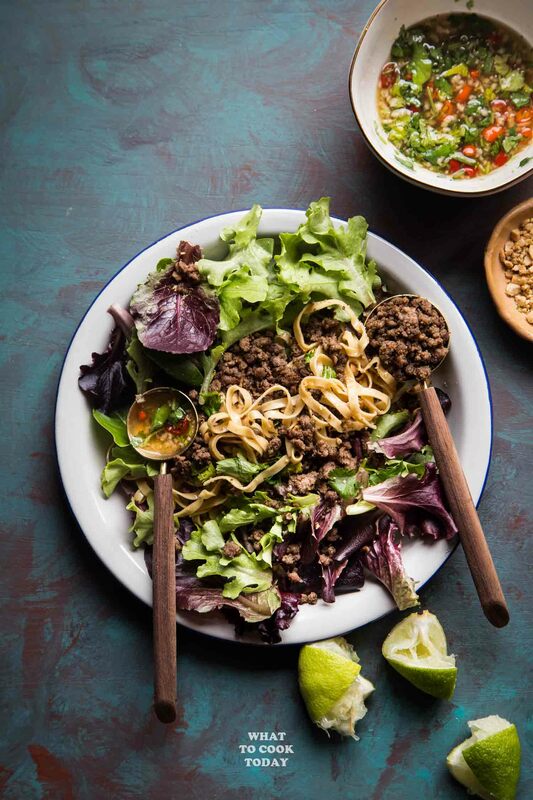 WHICH CUISINE DOES THIS ASIAN CRISPY GROUND BEEF NOODLE SALAD BELONG TO? I call it “Asian” because it is actually inspired by Chinese and Southeast Asian cuisine. 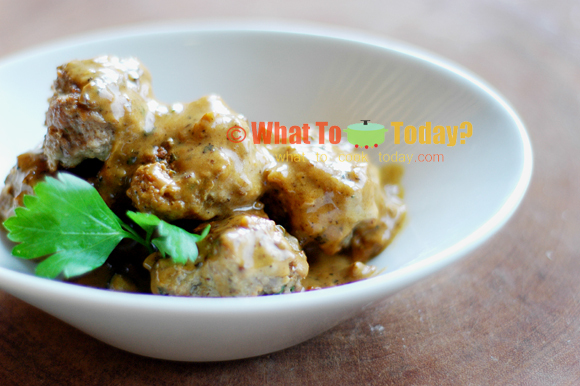 The use of Chinese five-spice powder and the dressing is totally Thai and Vietnamese inspired. So, it’s an Asian Fusion. I labeled them as “special” because not everyone is familiar with Asian ingredients. 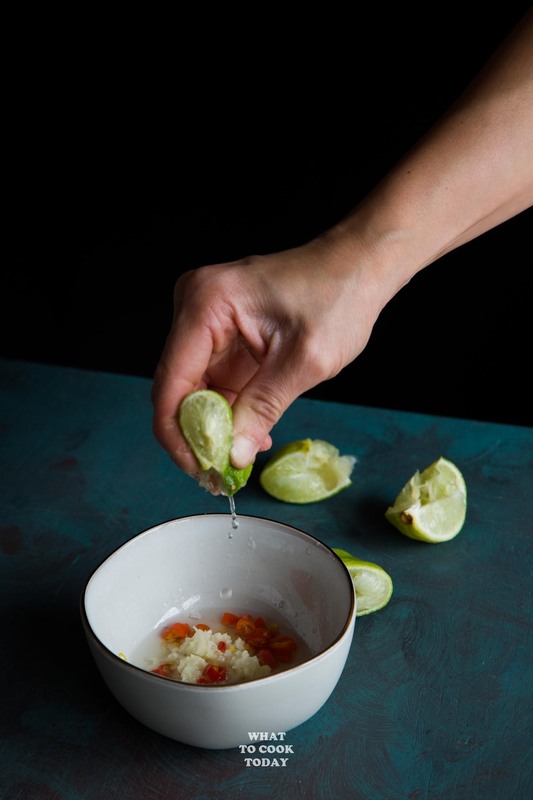 Fish sauce has gained its popularity in Western cooking these days. You can find it not only in Asian grocery store, but mainstream non-Asian grocery stores carry them too. Five-spice powder is commonly used in Chinese cooking. It is made of five spices: star anise, cloves, cardamom, fennel seeds, Szechuan peppercorns. There are also other varieties with slightly different spices. The one I used here is Chinese five-spice powder. They are commonly used to marinade meat and poultry. Now..eating salad has never been so delicious with all the amazing flavor and aroma. 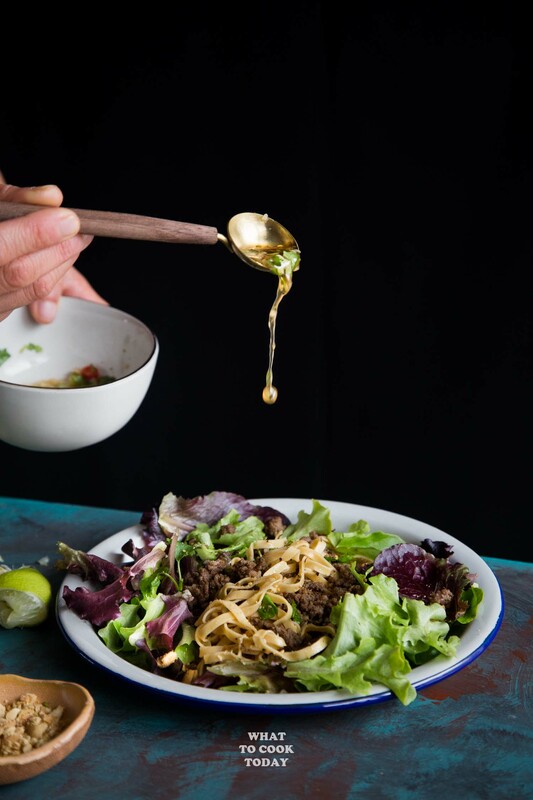 Ground / minced beef are stir-fried in aromatic five-spice powder until dry and crispy and topped on top of noodle and salad and drenched in sweet, sour, and spicy dressing! It's hard not to get addicted. 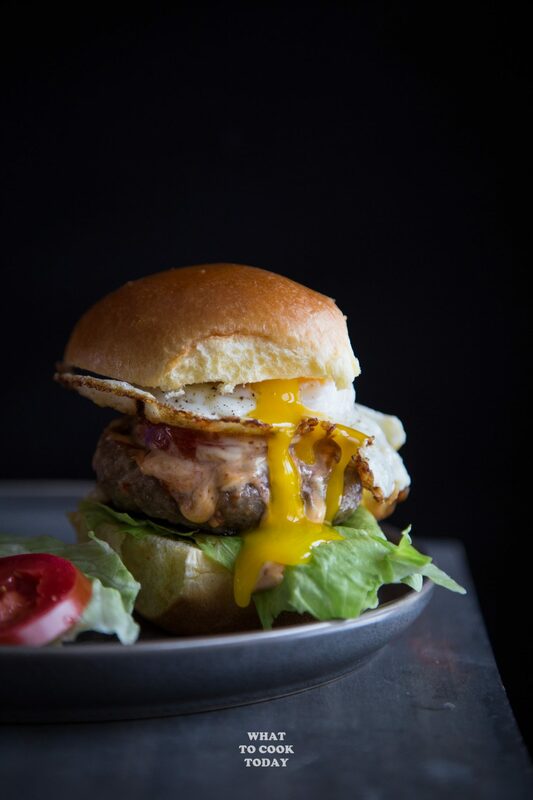 Can be made low-carb. Flip it to the other side to let it brown and crispy the same way you did earlier. Once both sides have crispy edges and textures, sprinkle in that five-spice powder, honey, and fish sauce and use your spatula to start breaking the meat apart while stir-frying at the same time. Stir-fry, while lightly pressing it against the pan/wok until the mixture is absolutely dry again. Remove from the heat to a plate. A beautiful salad! I have never made salad with ground beef, but I am sure I would love it!